You’re on graduation card messages, page 2 of 8 Graduation wishes, messages and quotes. See menu of related pages at bottom. Looking for those great graduation card messages and sayings for your son, daughter or friend? Here’s a huge collection of the top graduation messages including: funny graduation messages, sincere greetings, high school graduation card messages, college, and quotes for inspiration. If you’re wondering what to write or what to say on a graduation card, you’ve come to the right place. Enjoy these graduation card messages. Congratulations on your graduation. All your hard work is over, well maybe not yet. Good luck! Congratulations! Make sure that you treat your education as a springboard, not a finish line. Congratulations! Now you can finally start getting paid to work rather than having to pay to do it. Blessing and prayers on your graduation and for your future. Now that you’ve completed the goals other people set for you, make sure that you have a list of your own. Remember this day, the sense of pride and accomplishment that you take from it. Use that to move toward your next big goal. Congrats. Accomplishing the small things is the first step in achieving greatness – graduating shows that you’re well on your way! Know your audience. Does your graduate enjoy humor? How well do you know the graduate? How familiar can you be with your writing? Write out your message on scrap paper or the computer first so you can edit. Seldom do great messages come out on the first try. Edit, and re-edit again. Write neatly to make it readable. Occasions like graduation can call for using an exclamation point or two. But, if you put an exclamation point behind every sentence, they lose their impact. Personalize your card. If you know where a high school graduate is going on to college, make a reference. If a high school grad used to babysit for you, remind them how much you and your children enjoyed getting to know them. You don’t have to reinvent the wheel. Identify a message or two that you like from this collection and personalize it. Who doesn’t like to hear a compliment about themselves? For ideas on what to write, consider taking a 2-pronged approach: 1.) A look back at how you remember the graduate when you first met him or her, e.g. throwing newspapers on your paper route., and 2.) A look to the future. Graduation is a time to look forward and it helps to have lots of optimists around. Paint a picture of future success for the new graduate. End the message on a high note. Maybe it’s a compliment or a sincere wish. You’ll be great at that, and I wish you the best with your graduation card writing. Great results come from hard work. Well done! Congrats on your successful graduation. Just the beginning of successes for you. Congrats! After graduation, one word for you: plastics! Hard work: check! Good grades: check! Make some money: more checks! One degree = two happy parents! Congrats! Follow your dreams and good things will come. We’re so excited to share in the excitement of your graduation. Bravo! We’re proud of all of your accomplishments. Congratulations graduate! Best wishes for your future. Congratulations. May your dreams always be big and your worries small. Life is to be lived and explored. Make the most of it graduate! This calls for celebrating! Congratulations! You did it! Wishing you all the best! Keep learning, keep trying, and keep accomplishing. You did it. Now it’s time to celebrate! With love and pride today and always! Congrats graduate – you did it! But who lied to you that the hard work ends here? It’s only just begun. Congrats graduate, you have really outdone yourself! Your family and friends wish you nothing but the very best. Congrats on graduating! I wish you the very best of luck in all your future endeavors. May success always find you. Be proud of this moment – you deserve it for all the effort and dedication you invested. Congratulations. We are proud of you. Be proud of yourself. Many people never even start college, and many of those who do don’t finish. You did. Being a graduate doesn’t mean that you know everything – but you are better prepared to learn what life has in store for you. 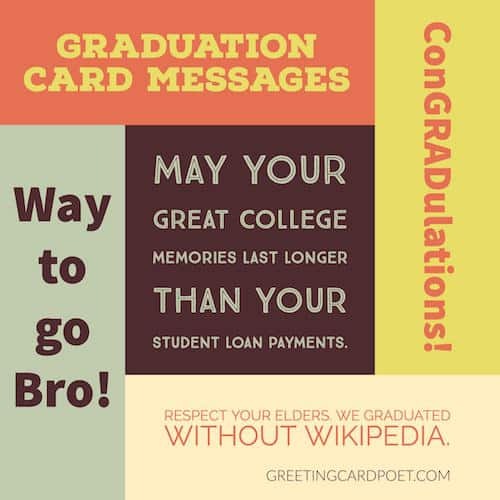 Tip: Use these graduation card messages as captions for photos on social media, in cards or photo books. Here’s hoping that your degree will unlock even more doors to the success you very well deserve. Congratulations! I wish you all the best for your future. Congratulations and let’s celebrate that new piece of paper! I wish you the best as you step ahead towards new challenges in life. Congrats and may all your other dreams be fulfilled. If you thought school was tough, you’re right, it’s all a piece of cake from here. Congratulations and good luck to you. I’m so very proud of you on your graduation day, Best wishes! Congrats on your graduation. We bet you feel like you can take on the world, and you can. But remember we’ll always be here for you. Congrats on your outstanding achievement. Wishing you all the best for the future and all its challenges and opportunities. Job well done! Here’s to your exciting new future and all the happiness that comes with it. Congratulations graduate! I am confident you will continue to succeed in life. Keep up the good work. Kudos for completing this important life step. Remember to always keep climbing the staircase. A toast to finishing what you started. I hope that you continue to do so for the rest of your life. Be confident that you’re now fully prepared for what life has in store for you. All the best. Learning everyday is the ultimate key to success. Don’t ever stop learning, dreaming and achieving. Go get ‘em, graduate! Looking back, wasn’t it all worth it? I’m sure you’re nodding your head in agreement – great job! More wonderful things are in store for you! Congrats! This wasn’t the first, and it won’t be the last time we get to brag about you. We believed. You achieved. Way to go kiddo! Graduation = Celebration! Way to go Grad! Now that you’re a graduate, it’s time to be courageous. Life is full of lessons that will challenge you all along the way. Now that you’ve graduated follow your heart and embrace what dreams are important to you. Cherish them. Own them. And pursue them with all of your might. Now that you’ve graduated, maybe you will be smart enough to figure out how to pay back your student loans. Now you can pursue your goals knowing that you can accomplish great things. Congratulations! Success is yours! You did it! Way to go! The door to learning was open when you arrived. Now that you’ve graduated, don’t close it behind you. The future holds no promises, but rather mysteries and surprises. What you’ve learned will prepare you for both. Congratulations and all the best for the future. The piece of paper may be about academics, but the experience was a lesson in life. Congratulations. There are few times in life when you’ll put as much work into a single accomplishment as you did for the last four years. Celebrate! This is a time for celebrating all your achievements, preparing for a future and embracing a world filled possibilities. All the best. To a happy ending and a new beginning. Wishing you the best on your new chapter. Congratulations! Today is your day. Wishing you all the best for what life now has in store for you. Tip: You can use some of these graduation card messages as photo captions on social media and in photo books. Today you’re a step closer to your dream and will soon be reaping the fruits of your hard work. Way to go Bro! Truly, you are deserving of this success. It’s now time to set newer and higher goals and don’t stop until you reach the top! We don’t know how you managed to get your degree with all the partying, drinking, socializing, and extracurricular activities, but we’re glad you did. Congrats. We know that the last few years weren’t easy for you. Nothing that’s worth it ever is! ConGRADulations. We’re all so proud of you. Now that you’ve got your degree, you’ll be buying the beer, right? We’re proud of you but it’s more important that you’re proud of yourself. Celebrate your accomplishment. We’re so happy that you’ve achieved this great milestone – Wishing you great success with your dreams and career. We’re very proud of you and your success. Your graduation is tremendous accomplishment. What a great feeling to be on top of the world! It’s time to celebrate your graduation day. This is YOUR day! What now? That is the question. When you think about the last four years, you’ll probably remember that your greatest lessons came outside the classroom. It’s a good reminder that learning doesn’t stop just because you got a diploma. Wishing you many more successes in the future. Congratulations graduate! Wishing you the very best on your graduation day and beyond. Congratulations! Write an essay comparing the value of a diploma versus the value of a good education. That’s your first assignment as a graduate. Quotes Life, Inspiration and Motivation work well on graduation cards. You did it! Now it’s all over, or it’s all beginning depending on which way you look at it. You entered school with big dreams and aspirations. Now it’s time to go get them. Wishing you all the best. Don’t ever stop learning and achieving. May all your dreams be fulfilled. Silly hat; Serious achievement. Congrats Graduate! When all is said and done, there was a lot more said than done. But, congrats – you deserve it. You’re stronger than you think, smarter than you know and loved more than you can imagine. Your graduation proves all of your hard work and determination was worth it! We’re glad you’re a grad! Your whole life is ahead of you. Be brave and follow your own dreams. Congratulations on your graduation. You’re a brilliant [ son / daughter / friend ] with so much potential and heart. Good Luck in all your endeavors. You’re a graduate! We’re all really excited for you. You’ve accomplished something worth celebrating! You’re now about to find out what learning really means. Wishing you all the best on this special day and good luck for the future. You’ve worked hard and it’s time now to reap the benefits! Your family and friends wish you nothing but the very best. You’ve worked so hard and successfully completed your studies. Now the real work beings with you’re new teacher – LIFE! The tassel’s worth the hassle. For the best graduation speeches, check out this NPR page. Looking for that perfect message for your daughter’s or son’s graduation? Whatever the case, the Greeting Card Poet has got you covered. We have something for all occasions. Pick the right message or quote to fit your personality or the recipient’s style. Some might like sincere graduation card messages while others might enjoy a little levity with a funny graduation saying. You be the judge. Use good sense and enjoy the moment! If you have any suggestions for graduation card messages, please let us know on our Contact page. Thanks.